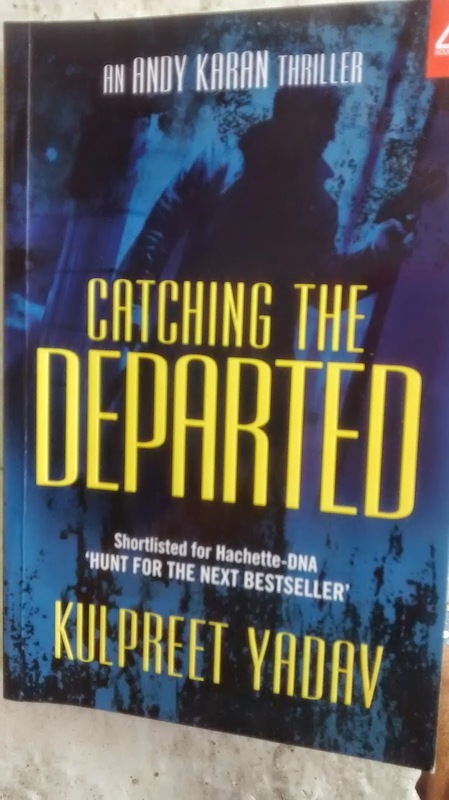 Catching the departed is a fiction/thriller by Kulpreet Yadav, with a plot centred around terrorism and investigative journalism, taking place around Mumbai, Delhi and a village in Haryana. An ex-army person, Andy Karan, currently works as investigative journalist for a popular magazine. Its editor, who gets tip off about a possible sleeper cell in a village few hundred kms from the capital and sends off Andy to investigate more. As Andy tries to uncover more, he faces death threats, more people die and suspense deepens as to who is behind this and what would happen next. Story was fairly gripping and sustained interest till the last part, wherein plot seems to have a derailment of logic. Carrying a nuclear bomb from Mumbai to Delhi by road in 2 days, Top industrialist deciding to keep the nuclear Bomb in his own house as if it is a Deepavali cracker etc looks like the climax has been arrived in a hurry. Do nuclear bombs explode with just shaking? Being little more factual and realistic could have made the book fully entertaining. Update: Author has updated me that a dirty bomb is conventional bomb filled with nuclear material, not a professionally made nuclear explosive. "A dirty bomb is a conventional bomb that disperses nuclear materiel. It's not a fission bomb & it's main purpose is just to create panic. It can therefore be small and volatile if not assembled properly. Dirty bombs are the next big thing that can affect all of us and I thought I should share this fact in the form of a story. " Also it is not clear why Monica's tail killed her abruptly. They were supposed to find out who she will meet/what she will do right? Apart from the last part, I liked rest of the plot- it sustained interest, no unnecessary deviations. Of late I am seeing high volatility of prices in flipkart- they change almost everyday. If you're not sure of buying this book at Rs 209, add to wishlist, you'll get a notification when price drops, buy at the right moment. A dirty bomb, Shrinidhi, is a conventional bomb that disperses nuclear materiel. It's not a fission bomb & it's main purpose is just to create panic. It can therefore be small and volatile if not assembled properly.